When you have easy to reach trigger points that create problematic referral pain, we teach you to do this. Self-care techniques are key to the recovery process! Kudos to Dr. Oz for getting to word out that people can self-treat myofascial pain! Many of the dear folks with whom we work have lived in pain for years. As a result, over-the-counter meds can play a frequent role in our lives. . . . While Tylenol certainly can be helpful, we need to remember to exercise caution when using over-the-counter medications. Last year, the FDA linked normal acetaminophin use to liver damage and pushed for stronger warnings and stricter dose limits for drugs that, like Tylenol, contain acetaminophen. When Antonio Benedi (right) of Springfield, Va., felt a case of the flu coming on one weekend in February 1993, he did what millions of others do — he reached for a common over-the-counter pain medication. 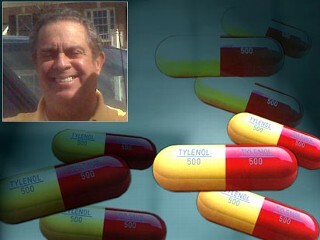 “I was taking Tylenol like I was supposed to, by the label,” he said. A few days later the then 37-year-old in a coma and in dire need of a liver transplant.